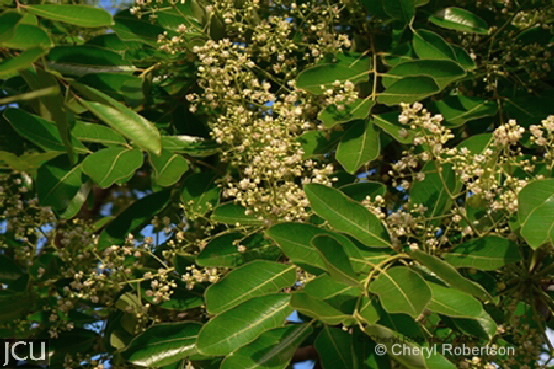 This tree from central and west Africa, has a smooth grey-barked trunk, and it can be distinguished from Swietenia by the different shaped leaves and the smaller globular fruit. The pinnate leaves have 8-10 elliptical leaflets, which do not taper gradually to the apex; the midrib is more or less flush with the upper surface of the blade. 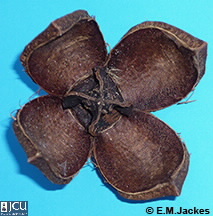 The fruit is a similar woody capsule but it is smaller to about 8 cm long and differs in shape. This species is resistant to termites but not to very strong winds. Fruiting summer.